Creating jams & jellies of exceptional quality requires patience, attention to detail, the necessary utensils, and use of only the best ingredients available. 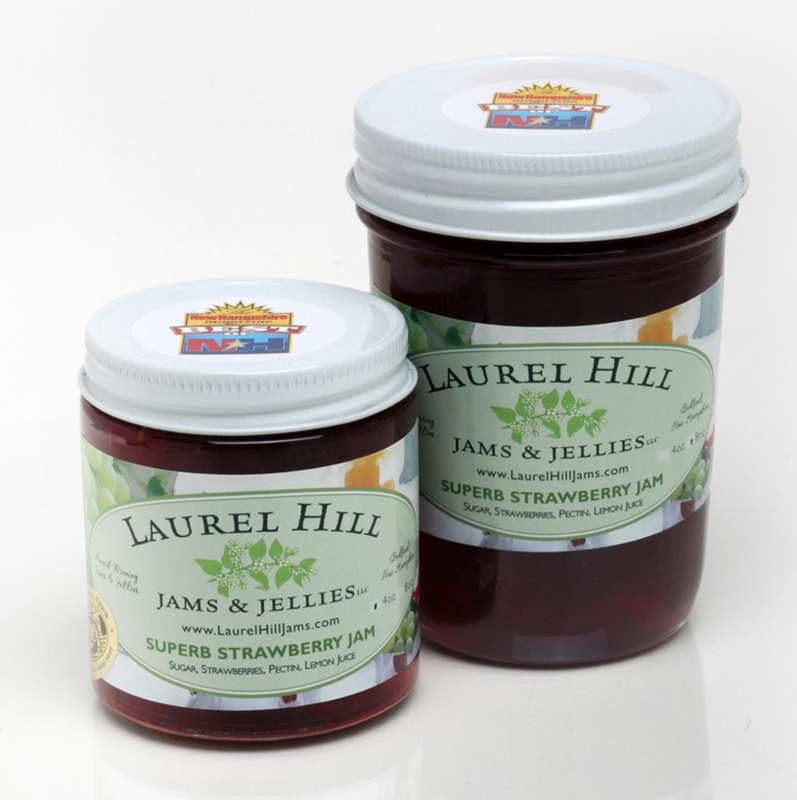 Laurel Hill gourmet jams and jellies contain no hidden extras, such as artificial colors or flavorings. The outstanding flavors come directly from using the best fruits and wines. The fruit jams & jellies and wine jellies are quintessentially New England, and are naturally gluten-free. Many of the ingredients used come directly from local farmers’ markets, which are a great source for excellent quality local produce grown without the use of pesticides. New Hampshire Magazine chose Laurel Hill’s Strawberry Jam and Raspberry Jam as Top Picks of the five jams tasted. Jams and jellies make excellent corporate gifts and wedding /bridal shower favors and can be easily personalized with special labels. Sue Stretch has been making her jams and jellies since she was a young girl growing up outside of Boston. She remembers picking beach plums with her mother during outings to the Cape. Sue has been perfecting her preserving techniques since the 50’s when she helped her mother make jellies and preserves. After she went off to college, began teaching, got married, and had two children, she took a hiatus. In the 80’s, she began jelling and jamming again. Living in the Okanagan Valley in Washington State on the border of British Columbia, her family was surrounded by an abundance of fresh fruits—apples, peaches, pears, cherries —and more. The women there taught her a simpler process, and she discovered the enthusiasm for home canning. Now, after 41 years of teaching, she is retired from the classroom and pursuing her jam and jelly business. Sue Stretch has lived in Massachusetts, New Hampshire, Wisconsin, Churchill and Winnipeg, Manitoba, Canada, and Washington State. Her husband, Jerry, is a retired Episcopal Priest. She has two married children and four grandchildren. The name “Laurel Hill” originates from the area of Bedford where she lives—Birchwood Circle. Laurel Hill is named on the topographical map of Bedford. The magnificent evergreen flowering shrub “Mountain Laurel” with its light/pink to white flowers blossoms around June 15th and surrounds her home. All products are made at her Laurel Hill health-certified residential kitchen.